I was barely paying attention to this ad from Le Creuset while going through messages because my normal mode is open, scan quickly, delete, repeat. Even and especially for places I am most tempted and/or inclined to spend money I shouldn’t be spending. So my eyes picked out the keywords: “Stockpot” “down to $80 from $100” “chilling” “brining”… wait, chilling? 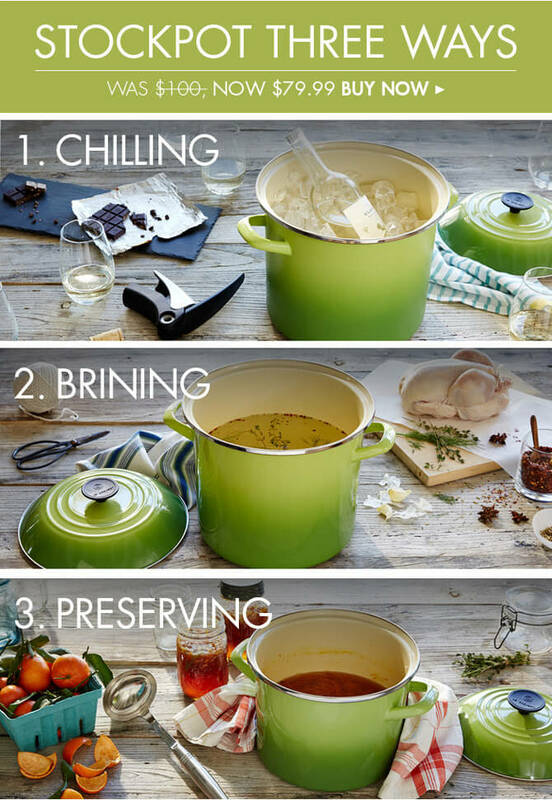 Apparently Le Creuset, who in other messages thinks that it is perfectly normal for you to continually own a completely new set of cookware in a color that matches the season, believes that your $100 stockpot should be used as an ice bucket. Now I’m with them on using it for brining or even making preserves and canning, but an ice bucket? And make no mistake, I think it’s a really cute pot and it comes in 10 colors, but that ad just got me shaking my head. And for the record, I am fancy enough to already have my own ice bucket. I keep my kitchen tools in it. Stay classy, LeCreu! Next story video: sousaphones are free speech too! When the notification came from this post, I thought you were selling ads, and like you at the start was scanning it and about to delete when I went back up & YEP! They tried it. Can not believe their marketing department is so dull that during this summer outdoor season they tried it. As if a gournmand that had their crueset would use it as an ice bucket. NAHHHHHHHHHHHHHHHHHHHH pluck it. That is the height of absurdity, seems terribly off-brand for their demographic, like they were as carefree as Ina Garten trying to show you a life hack about how to be carefree rich gurl who has so many of these pots in every shade that you would use an ice bucket! Like you, I’m fancy enough to have one, think mine has held various things at one time or the other. NYC doesn’t usually afford me to keep it in a spacious pantry, so I think at the moment it is storing other smaller vintage ice-buckets and party favors or bar napkin overflow. Seriously though, this was another example of an ad department, trying to be mobile/social media friendly that took a bad pun, made it visual, an thought – voila! One of our 250 different campaigns we have to run throughoutth year, it is summer, we’re hot, we don’t care. Quota filled. Good catch & great call.